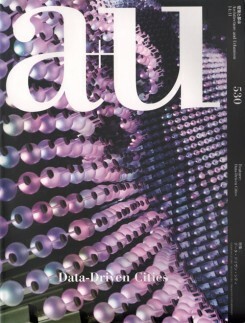 Guest-edited by Alastair Townsend, this issue dives into the complex topicality of the deluge of data driving urbanism and our lives today. It is often stressed how human agency (designers or users) must be the driving force behind technologies conceived to meet cities’ rapidly evolving needs. A series of themes is investigated (mapping, media facades, mobility, computational tools, open-source urbanism), shedding new light on the subjects underlying this contentious discussion. Filled with special features and interviews, plus contributions by Dan Hill, Eric Fischer, Carlo Ratti and Matthew Claudel, Thomas Schielke, John Frazer, Usman Haque, Geeta Mehta and more. Tokyo, 2014, 22 x 29 cm, 136 pages, illustrated, paperback.